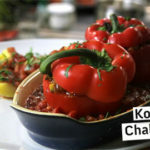 Das Rezept von Rainer in der Koch-Challenge Nr. 2. Exotic stir-fried vegetable dish with a mango & rice ring Wash the sweet potato, peel the carrots and chop both up into small cubes. Wash the leek and cut into fine long strips. Fry in a pan for about 10-15 mins in some hot vegan margarine. 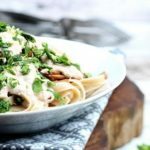 Add the plain VEGANKEBAB together with the grated ginger and make sure that all the ingredients are properly roasted. Then add the spices: chili peppers (deseed and cut into small chunks), a pinch of cardamom, caraway, coriander, curcuma (curry powder), cloves and salt. Finally, add the coconut milk and thoroughly mix. The dish shouldn’t need to boil any longer. Add seasoning and finally keep the dish warm until serving. Peel the mango and deseed. Cut into small cubes. Heat up the rice in some margarine, add the diced mango and season with some vegetable extract. Serve the mango and rice as a ring around the plate, add the stir-fried vegetables with the VEGANKEBAB and garnish with some parsley and red peppercorns.